Waldorf and Southern Maryland’s “Little Vegas” past. Gambling: Few Reminders today. Today many head home to Waldorf, MD and beyond on US 301 and have no idea of the history that they are driving past everyday. It was only this week while researching for a project for a client that I learned about this lively side of Waldorf and Southern Maryland‘s history. This post is not about the pros or cons of gambling. Instead it is an attempt to point out some of the relics of a time gone by that can still be seen. Wall’s Bakery known for its eclairs was housed in the Wigwam building after it closed in the early 70’s*. 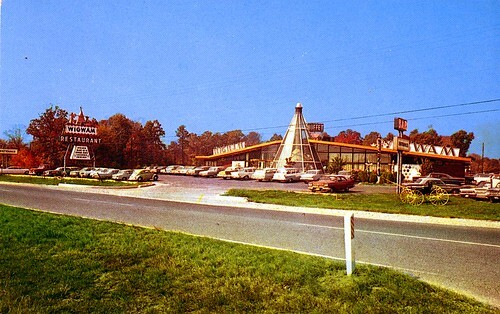 Gambling ended on July 1, 1968 when the last slot machines were hauled out of the bars, taverns, and roadhouses of Southern Maryland, piled onto trucks, and hauled away to be destroyed.1 The Wigwam — originally opened as a Native American themed casino. The Tepee-shaped building sported dancing girls, fine food, and performances by Doris Day and Brenda Lee according to Louise Lockhart, an 18 year employee. The Wigwam/Wall’s Bakery building has been recently torn down and this sign is all that remains. According to Wikimapia apartments are planned for this site. This entry was posted in Life, News, People, Photography, travel and tagged casinos, Charles County, gambling, gambling in Maryland, Maryland history, photography, slot machines, Southern Maryland, Waldorf, Washington DC local history, Wigwam. Bookmark the permalink. The Wigwam sign had been relocated to White Plains. It now sits beside 301 at the old Indian Head Railroad crossing. They removed the tracks and made the railroad into a bike trail. The Indian’s arrow points toward the eastern trail head, another chapter in history for the Wigwam. By the way, my brother made the round exhaust system and hood over the grill in the center of the Teepee. Thanks for the update. That’s interesting that your brother made the exhaust system and hood for the Teepee. What year would that have been? You must have some really interesting stories about the Teepee. Thanks for sharing Alan. Sounds like it was really good times! Hi Margaret, Thanks for letting me know that. Charles County Memories on Facebook has numerous other landmarks and history of Waldorf..
ok Margaret. Will take a look. I am by no means an expert on Charles County. I was given a photography assignment and was told to search out some icons to shoot. I did get fascinated by Waldorf as I knew none of this before the shoot. The WIgwam was not closed in 1968….Although there were no slot machines, it was still up and running with guest starts such as Chubby Checker, etc. in 1970..I don’t remember exactly when it closed and became Walls, but it wasn’t ’68…. Chubby Checker!! That must have been something to see. I wonder if he still had it then. On old 301 there was a club “Continental” and Charlie Daniels played there for a short time. Thanks again Sharon, I saw an article that stated that the Wigwam closed in the early 70’s and later housed Walls Bakery. I made the correction above and included a link to the newspaper reference. You’re so welcome…although I don’t live in the county anymore, I miss it, but have so many great memories….. Does the name George D. Clark ring a bell for you at the Wigwam? Hi Mary Lou, Please tell us about Mr. Clark. So nice to see this article. My family relocated to White Plains from Marlow Heights, Maryland in 1966 or 67. When we got there, I remember slot machines in almost every place on the “strip.” Two major landmarks that were not mentioned were Stardust – it was a nite club/restaurant with a horseshoe shaped hotel around it. Any performer who was in from the fifties through 1968 performed there from Jerry Lee Lewis, Elvis, The Everly Brothers, Diana Ross and the Supremes, and on and on and on!!! After the slots were outlawed, the big names stopped coming to Charles County. There was also the Desert Inn and Brown’s, two other very popular places along the main strip. Stardust was absolutely the most popular of all though. My ex sister-in-law, who was approx 16 years older than me once showed me a box filled with memorabilia and autograph books signed by so many famous people it was crazy. She worked as a waitress during it’s absolute hey-day and who knows how she got so many autographs!!! She had so many crazy stories to tell about those stars it is just unreal. Once, when still in elementary school, a girlfriend of mine and I went exploring through the woods behind her neighborhood. We went under a fence on a farm – situated right on 301 South and peered through a hole in a board on a huge barn on the property only to see that it was filled (and I mean filled) with slot machines!!! Thanks so much for contributing. Before I took this assignment I had no idea about Waldorf’s history. Those are some big names you are mentioning. I remember the slots in Waldorf as a kid and the Stardust Inn still did still draw the big names after the slots were gone…there were concert there all the time, I remember Chuck Berry and George Jones as well as several famous rock bands played there in the 70s and I believe there were still concerts into the early 80s. I’m still shaking my head hearing about all these stars playing Waldorf which had appeared to be such a small quiet town. Rock bands too! Stardust Inn must have really been something. I remember Ricky Nelson, Tiny Tim, Tammy Winette and George Jones , Loretta Lynn. Sonny and Cher , Chubby Checker . As kids I actually meet these people I was between the age 11-12 . The lights at night were magic . The pool at the Stardust lite up. The largest Rubber tree plant I ever seen. The club was beautiful, seen the shows going in the kitchen. The ones I spoke of stayed at Stardust, Tiny Tim went on down to the White House where they had room service. The Stardust had no kitchen except for 2 rooms that belonged to the owners . The bowling Alie is were I spoke with Chubby in person. And I knocked on room 4 where Ricky Nelson stayed. ( nice guy, good looking as so) shortly after that air plan crash that was upsetting. I took a Polaroid picture when he answered the door in a white towel, he thought his manager had left the key as me and my friend watched him go for ice. Memories I do have and what a time. They took the film and wrote us a lovely saying what great girls we were live , Ricky . I had moved after the death of my dad never to see those autographs of those stars . But all I need is my memories. I saw BJ Thomas and Mel Tillis at the Stardust in the 70’s. My folks went dancing there every weekend. HEY LONNIE–I USED TO LIVE THE THE NEW DEVELOPMENT BEHIND THE SPRING LAKE RESTURANT CALLED COUNTRY CLUB SOUTH IN THE 1970’S.I USED TO FISH THERE AND I WORKED THERE FOR A SHORT TIME.MY FIRST JOB WAS AT THE WALDORF RESTURANT AS A DISH WASHER.I WAS 15 BUT I TOLD THEM I WAS 16.I WALKED THE RAILROAD TRACKS MANY TIMES I WORKED AT THE STAR DUST INN WHEN I BECAME A NIGHT CLUB.LET ME KNOW IF WE CAN TALK OR CHAT-BYE FOR NOW. RICHARD HOAG. My aunt ran the Waldorf motel for a long time and my uncle restored/repaired those old slot machines. My whole family at some point in their lives resided in the Waldorf apartment behind the motel. That’s interesting Carrie. You must have seen a ton of stuff. What’s your best memory of the Waldorf Motel? Some years ago I had dinner at Rip’s when it was located in that building. I had no idea of the history of the place at that time. Since my aunt was the manager for a while, I would go into the main office and help her with paperwork and checking in customers. I don’t know why I remember this….but there was a cigarette vending machine in the lobby. I also remember a lot of police cars outside the motel late at night. I never ate at Rip’s, but I heard the food was good. A lot of my family lived in the Waldorf apartments behind the motel and I remember having big family get-togethers with lots of food. I was sure that your best memory was going to be about someone famous that you met or saw. I love that your best memory was about simple things and your family. Sounds like a good life. Thanks for your responses. We used to go to Morgantown Beach down near the Potomac River Bridge. Just before you got to Morgantown, there was Pop’s Store and he had 2 nickel slots. Just an old country store to buy bait, sodas, beer, etc. Pop Thompson would let us kids play the slots. It was a great memories dropping a nickel or two into the machine and pulling the handle! Vickie, that must have been big fun. Thanks for sharing. interesting enough for me as my parents bought a house in waldorf in 66. I lived in waldorf til I was 21 but still in area. Recently, I came across reels and reels of film dated back to the late 60’s my parents had, I am in the process of coverting them to dvd with the first 2 enroute back to me as I type this. I’m very excited to see whats on them and if anything relating to the history I will let people know as this was and to some still is our “home town” with wonderful memories a lot of people would never imagine existed. I’m surprised your piece was not longer but as you said an assignment. Maybe someday someone will do an in depth history piece on our old stompin grounds. Those reels hold lots of good information. Who knows what might be on them! Yes, I just stumbled across this history by trying to find some meaningful pictures to take. I started with the Waldorf motel to see what it was and then I saw the words Little Vegas and my interest exploded. I grew up on Holly Lane, which is right passed the where the Wigwam was. (Behind where the patient first is now.) It was Walls Bakery by the time I lived there. (It was the 90’s). In the house directly behind mine, lived a lady we referred to as “Mrs. Walls,” who worked at Walls Bakery. Now, I don’t know if that was even her real last name, or if she owned the place or what, but and I would go sit with her and play in the dirt while she gardened and things like that. She was really nice, and it was always a special day when I happened to see Mrs. Walls, weather it was in the Bakery, or at home. I no longer live in Waldorf, but it will always be my home. Also, my elementary school bus used to drop kids off who lived in the Stardust Motel. Thank you so much for sharing all of this information! I had no idea Waldorf was a little Vegas, with so many famous people coming through. I am more proud than ever to say I grew up in Waldorf. It’s even more of an interesting place than I thought. Thanks, again! I am really enjoying these responses. Seems like new tidbits come with each one of them. “Mrs. Walls” sounds interesting. When I worked in Clinton folks would rave about and sometimes bring in donuts and pastries from Walls Bakery (they were good). I knew that they came from that teepee shaped building but I thought nothing about the significance. That is interesting about families living in the Stardust Motel in the 90s. Too bad that there is not more info and pictures of the motel. Becky, Mrs. Walls had a German accent, very distinct and you could not miss it. I am not sure the lady you talk about was Mrs. Walls who owned the bakery with her husband, my Uncle George. They had a house on I thought Garner Avenue and the house was basically right behind the bakery premises. Mrs. Walls did plant flowers and tended to her own garden of flowers, plants, bushes etc. Thanks for your comment. Seems like every commercial building in the area had some slots in it. I was but a child when my mother used to go to Waldorf from Clinton to play slot machines, or my parents would go to Stardust to watch a show for parents night out. When I was 15 going on 16 I myself started hanging in Waldorf at the Continental Club which was owned by JC Richards. I would go there to listen to the music, and dance,( I was way too young to be in that place, but with my mothers permission JC let me come in ), I met some of the nicest people there, and still know many of them to this day. I also met my first husband Gordon whom was the drummer in the house band that played every weekend. From there I went to many of the other places that JC and the Richards family had, they ran the Continental Club( which is now Memories), then after that the Country Castle( which is now gone, but was a furniture store) at this place I met all the starts that came in because my husbands band was the house band..there I met, Little Jimmy Dickens, Earnest Tubb & The Trubadors, Webb Pierce, Whispering Bill Anderson, and many many more..and from there to the Round-Up ( which is not the Legion) all of them were on 925 Old Washington Rd. A lot of good information, Donna. Back then who needed New York when you had Waldorf! Sounds like you had some good times and met some wonderful people. I think of this history each time I visit Waldorf. Wigwam sign was relocated to a bike rails to trails entrance in White Plains. Bring back some slots! Why not!? Yea Gerald, one can drive up and down Route 5 today and have absolutely no idea about the old Waldorf. I did it for many years. Thanks for commenting. So many fun memories, reading all this about Waldorf and the 301 strip. Enjoyed seeing Frankie Valle & the Four Seasons at the Stardust I think it was ’68. Those days rocked! Thanks Barbara! more stars! Now I am just waiting to hear someone say Elvis played the strip. At this pace I wouldn’t be surprised. Waldorf, Maryland!!! I believe it was Kathy Vaughan, towards the top of these replies that said Elvis and many others she mentioned were at the Stardust from the 50’s through 1968. I myself was not old enough to be there at that time but I really enjoy hearing about any new and all history about Waldorf, White Plains and La Plata because it was a real and true Las Vegas, my mother’s prime time and she absolutely loved it. She brought myself and my siblings up with the music she so enjoyed and I did the same with my children. My son amazes any new friends he makes because of the music he listens too, but it’s not long before there listening to the same music. It makes you happy, it makes you get up and dance and that’s the best exercise I’ve ever known. I feel extremely lucky to have lived a part of the great times in Waldorf and to hear about the rest from my mother. But, I did go to the Stardust for concerts and loved every minute of it. BJ Thomas was the first I was to see there. But, I was told that Elvis was there. My mother and I were just talking earlier today and believe it or not we just so happen to be talking about the history of Waldorf. My mother worked at the Waldorf Restaurant and Walls Restaurant/Bar. She also worked at what is now called McCauley’s Pub but can’t remember what it was called in 1960-1961. She is a great historian but she just can’t seem to remember the name of that particular restaurant/bar. So if anyone happens to know I would really appreciate the information so I can let my mother know. By the way, I did see Elvis but it wasn’t at the Stardust. I would have loved to have seen him when he was there but at least I did get to see him. I noticed know one has mentioned a place my mother just told me about as well. It was a famous restaurant called, White Lady Restaurant that is now known as the Paddock. She said it was very well known for its seafood. She was a child at the time but said that my grandparents would take her and her brother to this restaurant from where they lived in Washington, D.C., because the food was so good and it was a happening place. I don’t know when Jeans Las Vegas Restaurant was built, 301 North between McDonalds and the new 7 Eleven is where it was located, but I know it had been in Waldorf for quiet sometime and was a hot spot/ had excellent food as well. It’s kind of ironic that someone stated earlier that they had seen a barn full of slot machines because I and some of my friends had heard about such said barn but never knew of the exact location. As far as the bowling alley someone mentioned earlier. Curly, the owner had many stars show up there as well. Maybe that’s how they wound down, not sure but he has a booming business as well. It was a duck pin alley. I really enjoy this site so thank you very much Mr. Lonnie. I believe you could keep this going for quite some time because the historical stories, hopefully are never ending. Yes, I probably did comment. When I was a kid, my much older brother’s wife, also much older than me, had a big box of memorabilia she kept from when she worked at Stardust and Waldorf Restaurant. She had a book with autographs and also had a bunch of photos and even napkins that were autographed by famous people! I loved it when she would get that box out! They divorced many years ago and my brother died 15 years ago so I now have no way to question her. I don’t think that Elvis ever played there but alot of other well known names sure did. I remember seeing CCR (Credence Clearwater Revival) there with my husband at a time when his best friend had just bought the place. Can’t remember what year that was though. 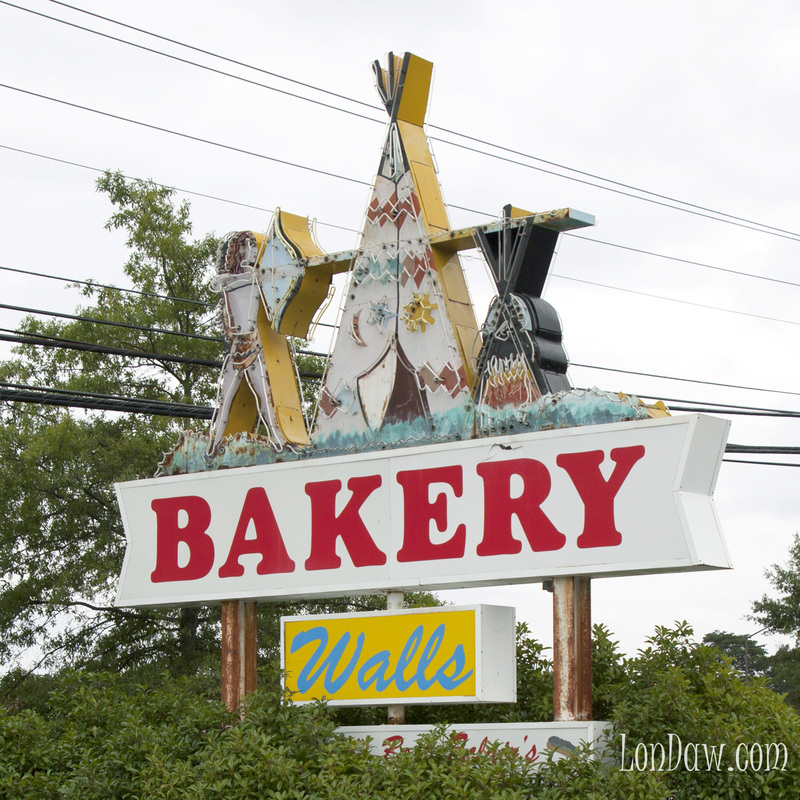 Walls Bakery used to be the WIGWAM in the late 60’s and early 70’s. It used to be a night club at that time and up in the front windows were girls dancing in cages I believe. Anyway, on the weekends the lines were out the door waiting to get in there. There were also other bars and restaurants up and down the strip where you could dance, play slots, etc. Also seems like there were alot along Rt. 925 also. Down around where Denny’s is used to be the 301 Drive In Theatre. Waldorf was a jumpin’ place back in the day. We had a lot of fun down there back then. It was the “In” place to go. Linda that sounds like a great experience. MY DAD WAS FROM CHARLES COUNTY, HE WAS BORN IN ALENS FRESH NOW KNOWN AS POPES CREEK, HE WAS MY LITTLE PIECE OF HISTORY. HE WAS BORN TO AN AFRICAN AMERICAN MOTHER AND A GERMAN DAD WHO WAS CALLED CAPT DRINKS SEAFOOD RESTAURANT NOW KNOW AS CAPT BILLY’S CRABS AND SEAFOOD RESTAURANT, MY DAD WAS BORN IN 1918 LEFT CHARLES COUNTY IN 1933 TO JOIN THE CCC CAMP IN WASHINGTON DC FROM THERE HE JOINED INTO THE ARMY AND OFF TO WORLD WAR II. HE OFTEN SPOKE OF LITTLE VEGAS, HE ALSO SPOKE OF THE BRIDGE CONSTRUCTION TO VA ..A LITTLE PIECE OF HISTORY. HE SAID WHEN THE BRIDGE WAS BEING BUILT WHICH TOOK SOME YEARS PEOPLE CAME FROM THE NORTH AND SOUTH TO CHARLES COUNTY AND SOME PARTYING WAS GOING ON AND SOME BABIES WERE MADE!! LOL LOL 🙂 SOUNDS LIKE SOME FUN….. Thanks Joanna, Not clear about your comments, Your grandfather was called Captain? What about Drinks Seafood Restaurant? Was that a hangout place or something he owned? Please help me understand because I find this interesting. 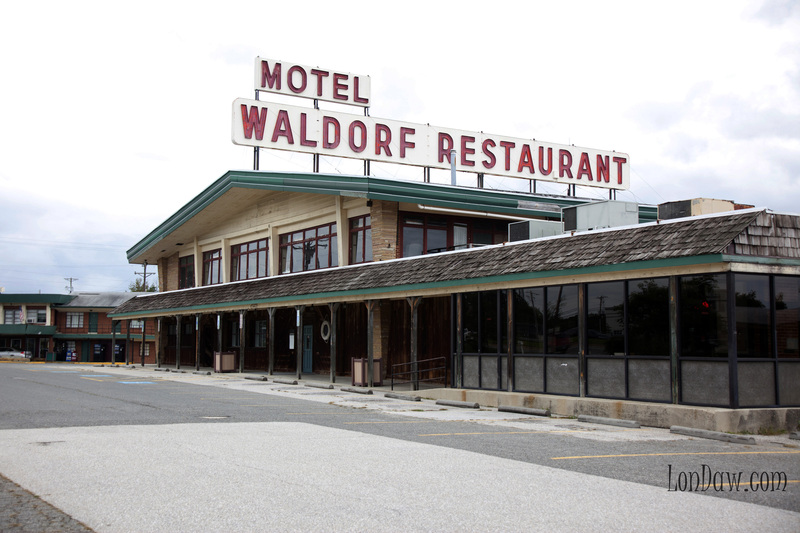 In the 50’s and 60’s, Waldorf was a gambling Mecca. The strip was alive. Then the government decided to outlaw gambling and that era came to an end. A lot of families lost their livelihoods. The route 5 corridor became a ghost town. Then the government decided to start a lottery, as long as it was run by the state and they got their cut. But that didn’t help the people who lost their business and homes. The corridor remained empty and desolate with closed hotels and businesses until the 80’s. The money was supposed to help education but the school system remains poor with no books or supplies. This is what the government did. Now they, once again passed slots in our state but only if they run it and get their cut. It is sad that the people of Maryland put up with this treatment. I remember going south to Waldorf to the Stardust when we were living in Clinton. we always took a group from Windbrook to dance and listen to the great entertainment. I specifically remember what a great show FATS DOMINO put on. Fats Domino!!!!!! The Stardust must have really been something. Correction, my mother worked at the Wigwam Restaurant/Bar. Not Walls restaurant/bar as stated below. Waldorf was more than people outside could ever have imagined. Had the government not shut everything down in Waldorf, there would have been good living for many, many years. I would love to know the real reason why everything was shut down, that caused so many people to lose everything they had. People to this day, generations later still do struggle. When it was jumping it was unbelievably the best times ever. Reblogged this on Lonnie Dawkins. By the way for those who don’t know, the Walls Bakery has opened a small bakery on 925 North after passing car lots on right, in a small little strip of stores on the right. The chocolate eclairs have not changed, they are just as big and delicious as they have ever been. Go slow when driving so you don’t pass it. Mr. Lonnie you have to try one of the eclairs or any of there baked products really. They are absolutely delicious. I believe it is Walls family working there. Not sure if it is a daughter or not but you definitely hear a hard German accent from the blond haired woman who is always there. I’m sorry but I can’t think of her name at the moment. Enjoyed reading all these comments about Waldorf. I was born and raised in DC, so got to see a lot of Waldorf! Saw Conway Twitty, Jerry Lee Lewis and George Jones at the Waldorf Resturaunt. In the early ’70s I got permission to take my 9 yr old daughter in to see her favorite group: Paul Revere and the Raiders! We got to sit through two shows and meet the boys afterward…..she was sooo thrilled! Many a good time, and well cooked breakfast, was had at the Waldorf Resturaunt! Thanks June, Paul Revere and the Raiders….!! Now, the Waldorf Restaurant is confusing me. It was a restaurant, a motel and had room somewhere for big name shows??? There’s, Cooksey Store, Wayside STore, Belalton truck Stop, Thunderbird Motel. I worked at Bendix Satellite Tracking Station. I lived on Crain’s Farm in Mount Victoria, Maryland. Cooksey Store had 3 nickle slot machines and 2 quarters. Graduatedfrom LaPorta Senior High. Schools were not integrated until 1965. I’m the first in my family to graduate after fighting for my rights to stay in school after age 16. I know you remember all that I’m saying is true. I interracially married and was band from Charles County by my family and Bennett Crain. Lol , now it’s totally interacial. Hit me back and we can exchange stories. My father Mr . William Jupiter was a farm labor aka Shorty/Tiny Man. Blanche, thank you for your comments. What do you mean by fighting for you rights to stay in school after age 16? What you all remember about Charles County is totally different then the poor black share cropper remember. We had little places like Spearman Butler Inn, Crab Pot, Laplata Inn, Greenacres and the country stores where we brought weeknold meats and breads. We traveled by tractor and wagon. We wasn’t allowed into the places that you talk about. Proudly praising the Lord for the strength to survive. I understand that my grandmother, Ginny Glaze (strummin’ Ginny), played banjo and sang at the Wayside in Waldorf in the early 50’s. She sang bluegrass (called hillbilly music back then). The bar/store was owned by Joe Torres. The Stoneman family and Jimmy Dean’s Wildcats played there as well. Does anyone have any information about the Wayside or Joe Torres? I remember it that way. I never went into any of these places, I was I kid. … but I had a grandmother and her 2 sisters who liked occasionally to drive from their neighborhood in NW Washington to Southern Maryland to luncheon and play slots. Waldorf was a bit racy for the old ladies I think and it seems they preferred waterfront destinations like Chesapeake Beach and Benedict. For a stretch of years my siblings and I were part of the weekly trip in summer. Whenever the description was Benedict we would run through Waldorf. I remember when all those places stood and thrived. The Wigwam was always pointed out as we passed. I remember the Stardust too I never managed to see Waldorf at night in those days. A close and personal business associate to Meyer Lansky himself, and a made member of “La Cosa Nostra” in the Boiardo regime of the Genovese crime family, who was one of the more successful mafia members of all time, was one Charles “the Blade” Tourine. This immense wealth and great success of his, can be directly attributed to his various financial interests he held in the gaming industry and specifically in his interests in various casinos around the world. As a mafia buff, I have always believed that La Cosa Nostra has never gained any sort of foothold at all in the Washington DC area, other than for a small and rather insignificant presence in Baltimore, the mob was essentially non-existent in my home state. Today, however, I learned I was wrong. Apparently, “The Blade” had his casinos in many places around the world, including such illustrious cities as Havana, Cuba, Las Vegas, Miami, New Orleans and last but not least, WALDORF and CHARLOTTE HALL, of Charles and St. Mary’s counties, in rural southern Maryland. The Sportsman’s Club in Charlotte Hall and the 301 Ranch in Waldorf were both casinos belonging to Tourine and his partner, who along with Edward Warring and the “Warring brothers” was the closest thing in Washington DC history, to a local organized crime/gambling boss in one: Joseph Nesline. I have yet to have found specific addresses to these establishments, but I have seen references to the “Thunderbird” and I know that the “Wigwam” used to be a casino back in the day too and I wouldn’t be at all surprised to learn that both those joints once belonged to Tourine and Nesline as well! Freaking unbelievable to think that Waldorf and Charlotte Hall, each existing as gambling Meccas and hotbeds back in the 60’s. And so much so, that a genuine friend and business partner of both Meyer Lansky and Charlie “Lucky” Luciano, inarguably the two biggest gangsters in American history, as I know Charlie Tourine truly to be and was, as I’ve seen FBI files listing Tourine as one of Luciano’s main mob contacts after his deportation back to Italy, with the FBI having documented several of these meetings between Tourine and Luciano in Italy. As such, this all serves to make him, “The Blade” one of the biggest American gangsters in his own right! You don’t sit down with Luciano on a one on one basis, it it was otherwise! And yet there he is, bringing along with him a giant movie star, celebrity, Bugsy Seigel best friend and mob flunky, George Raft on down with him to Waldorf to play freaking slots and probably eat Wig-Wam donuts. And also, there Tourine is, in his NY Park Avenue penthouse, making phone calls to nowhere but Waldorf and La Plata Md., which apparently, the FBI was monitoring the entire time. (and probably doing so illegally as well, as I don’t see anything about any warrants in these files, LOL, and these files and interviews are dated: 1964, which was directly after the Mclellan hearings were held and led by Joseph Valachi blowing the whistle of organized crime in America for the first time, which led the FBI to have to play “catch up” on the mafia and do so by any means necessary, legal or otherwise, which led it to commence in a series of illegal buggings and violations of civil rights). You’re welcome JoAnne and thank you for your comment. It must have been wonderful times. Who was your favorite star that you saw? We saw Kris Kristofferson there in the early 70s. I think he was at the Stardust, but I not positive. Back in the 60s we used to drive down from Linthicum Md to play the slots. We had more fun then, feel bad for the young people. Back then Maryland had it all. Drive Ins, Stock Car Races Trotters. Route 1 and Route 3 had it all.